Happy New Year, folks! I have a bunch of artists to listen to and write about, but first I just recycle this one that originally appeared in the Finnish Colossus #45 magazine as a part of my article on recent Esoteric Recordings' releases. It's not often that I can sincerely rate an album with one star only! This album is such a strange case, but hardly that kind of experimental work which anyone would think to be a mind-blowing listening experience. 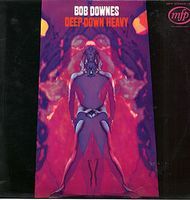 Flutist-saxophonist Bob Downes was in the sixties a free-minded musician jumping over any musical fences, wandering amidst jazz, avant-garde and pop. In the year 1970 he released THREE albums - and each on a different label. Deep Down Heavy was made quite spontaneously in a short time, and it sure sounds like it. The main elements are bamboo flute, traffic noises and a gritty blues-rock backing, plus awfully bad singing with lyrics by the poet-collabotaror Robert Cockburn. No, this is not a unique, "challenging" work of art demanding the listener's patience to reveal its genius. It is, quite simply, an artistically poor thing done in a careless manner, and not any amount of brave personality can hide that fact. On the opposite, this album is after all so sincere, literally "on the street level", that it doesn't even attempt to impress as emperor's new clothes (except for the interesting, psychedelic cover art perhaps - which frankly gives very false expectations). One sympathy point deserved.